We saw the last two turtles on the last night patrol on 30 June. With lighting off in the distance, our patience paid off as we encountered Molly and Luna one last time each. 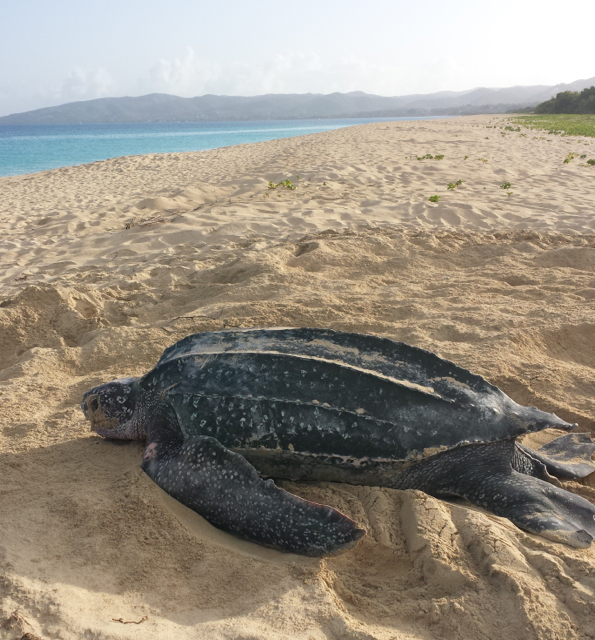 Overall, the nesting season was slower than usual, with 49 individual turtles identified, laying just over 300 nests (turtles may nest up to 10 times each). Of the 49 females, 15 were turtles new to Sandy Point, while the rest had nested sometime in the past, with 3 turtles nesting as far back as 1995! It’s great to see them returning year after year. Hatchlings began appearing with the first nest that hatched on 20 May; several nests hatched each day following that until 9 August. We had students and volunteers who participated in several research projects this year, including the genetic identification of nesting females (and hatchlings), in-water habitat movement patterns of nesting females and the assessment of injuries on nesting turtles. Each of these projects gives us an opportunity to learn more about these turtles so that more informed management decisions may be made.